Pink Mums, a photo by randubnick on Flickr. It's fall and autumn flowers are on display in front of the grocery store, bright mums along with tiny pumpkins. I was running a quick errand after a very hectic week, but I stopped for a minute to look. 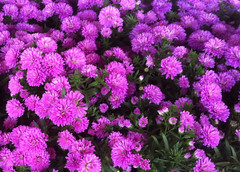 I like the fall colors, but my favorite color for mums is pink, so I took a couple of quick pictures. Tonight I used iPhoto to crop this image from the best photo. Little Apple, a photo by randubnick on Flickr. Yesterday, I found myself with time on my hands in the waiting room at the vet. So I got out my iPhone and drew this image on my Brushes app. Once I got the image into my computer, I used iPhoto to crop it to get this composition. I am going to use this little apple to wish friends and family a sweet new year. Two Autumn Roses (WDCT), a photo by randubnick on Flickr. 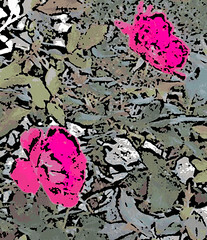 Tonight I cropped this image out of the photo of autumn roses that I posted here yesterday, using just two of the roses. 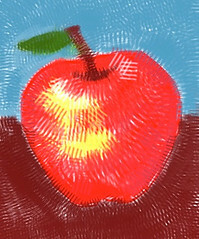 Then I used my Painter program to turn it into a digital woodcut. I used a lot of trial and error with the controls, trying to get the effect I was after. Autumn Roses (Posterized), a photo by randubnick on Flickr. 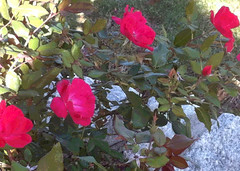 Back on September 18 I saw some beautiful red roses still in bloom, so I took a picture. We were walking the dog over at the Cummings Center Pond, here in Beverly, MA. The color was amazing! I have been meaning to do something with this image, so tonight I edited it in iPhoto and then used my Painter program to posterize it. There is a lot to love about autumn roses, but what I admire most is the optimism of a flower that produces such vibrant color just when the autumn leaves are starting to turn. 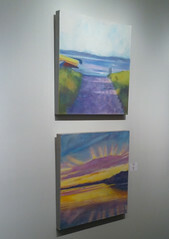 Two Paintings in the Gallery, a photo by randubnick on Flickr. Today was open studios at Porter Mills, so I was in the studio all afternoon talking to the people who came by. At six, the gallery downstairs opened for the reception. All the artists at Porter Mills have work on display in the gallery. I have two oil bar paintings on display, "Path to the Beach" and "Still Amazed", and tonight I finally my first chance to see how they looked on the gallery wall. I was happy about the studio, happy about the event, and happy about my paintings, so I took this picture. Two Pastels in the Studio, a photo by randubnick on Flickr. This morning I went to the studio at Porter Mill to get ready for the open studio event tomorrow, and spent a couple of hours straightening up and hanging art. 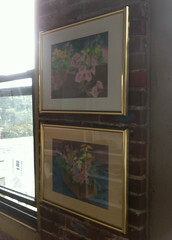 I put two of my pastel still life drawings on a brick wall. The one on top is a drawing of petunias in a windowbox, and the bottom drawing is of a basket of flowers. I liked the way these drawings looked against the brick background, so I took this picture. Guinea Fowl with Green Beans, a photo by randubnick on Flickr. Today was Thursday, so this afternoon we went to Long Hill Gardens to get the weekly haul of produce from the Food Project (Community Supported Agriculture). I was out in the fields picking green beans when I heard a funny noise, which I realized was coming from one of those rather comical birds I had seen there. 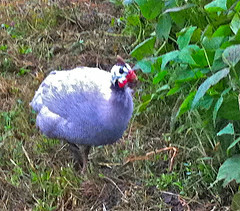 (They are actually guinea fowl; they look like a chicken and a wild turkey hybrid, and they make the strangest noise!) Anyway, I dropped the green beans and got out my iPhone. I tried not to startle the bird, but it was alarmed by the sound of the phone, and made lots of sounds of its own as it ran away toward the other birds, warning them of papparazzi. Well, this is the best of the pictures I took, and I had to work hard in iPhoto to make it look as good as it does. (I may try to make it into a digital woodcut.) If you look hard, you can see that its feathers are grey and white polka-dot, so I guess this counts as research for the chicken collage I have been working on. Water Lilies in September, a photo by randubnick on Flickr. This is a photograph that I took today during a walk at Bradley Palmer State Park. (We stopped there for a quick walk on the way back from the vet.) 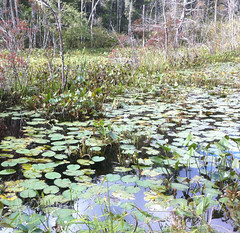 The weather was a little cool, but the water lilies still looked great, so I took some pictures of them. Tonight I edited this one in iPhoto and cropped it to get this composition. 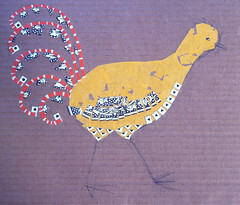 Chicken Collage Day 6 (Sept 17 2011), a photo by randubnick on Flickr. 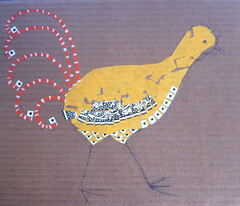 This little chicken is a work in progress, a collage inspired by some real live chickens that I saw last month. The patterns on their feathers gave me the idea to create a paper chicken made up of patterns. I did a little work on this today up at the studio. I used some yellow paper to close up gaps in the body of the bird. Then I started placing pieces of paper on the tail feathers to see if my idea would work. (I am using black and white patterns cut from the border on the cover of an Arches watercolor pad.) I liked the idea well enough to paste the pieces down. But it looks like I am going to have to buy another watercolor pad because I am running out of black and white pattern. September Hydrangeas, a photo by randubnick on Flickr. 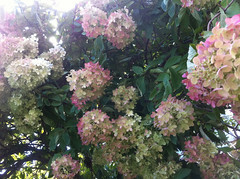 I saw some hydrangeas today during a late afternoon walk, so I stopped to take a few pictures with my iPhone camera. During the summer, the blossoms are white, but when the cooler weather comes in September, the hydrangeas turn to cream and dusty rose. I didn't do much to this photo except for cropping it just a little bit in iPhoto. Evening Light and Low Tide, a photo by randubnick on Flickr. 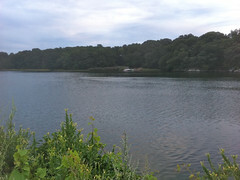 This is a photograph that I took Tuesday night, during an evening walk at Obear Park, here in Beverly, MA. It was low tide and the sun was going down. The shapes of the exposed sand bars were interesting, and so were the shapes and colors in the evening sky, so I took this photo. Tonight I used iPhoto to crop the original to get this composition. Necklace with Blue Felt Bead, a photo by randubnick on Flickr. Last week I learned how to make beads from rolled felt. This is something I had first heard about from my Aunt Edy, over the phone. (She in her nineties, and started making jewelry six years ago.) Her designs are beautiful! Well, the idea of making beads out of felt sounded intriguing; it was hard to get an idea of the process over the phone, so I looked it up on line and got the general idea, but had never gotten around to trying it. But last week I had a chance to spend some time with my aunt, so she got me started in person. I rolled a strip of blue felt around a skewer, and then closed the end with needle and thread. 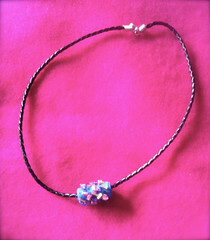 Then I started adding pink and silver beads with needle and thread, pretty much in a random pattern. (Not that I had a choice: I don't have much control yet!) When I was done, I took the felt bead off the skewer and put the it on a ready-made leather choker that I had picked up at the bead store. It was fun to do this and even more fun to spend time with my aunt. Front Range Memory (Posterized Photo), a photo by randubnick on Flickr. Tonight I used iPhoto to crop this image out of the background of a photo taken during a recent trip to Colorado (close to Colorado Springs I think.) Then I opened the image in Painter and used color overlay on the sky. After that, I used the "magic wand" tool to posterize the image by sections, following the lines of the landscape. I liked the effect, a soft quality suggesting a daydream or a memory. I decided to call this "Front Range Memory" because most of my trips back home to Colorado involve driving up and down the highway along the front range of the Colorado Rocky Mountains. Cloud Over the Mountains (Posterized Photo), a photo by randubnick on Flickr. 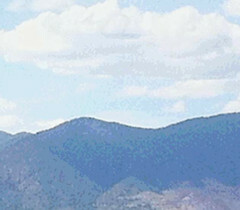 This is another image of the Colorado mountains, seen from Colorado Springs. I cropped it tonight out of the background of one of my photos from a visit to my home state. Then I used Painter to adjust the focus and then selectively posterize the sky, the cloud, and the mountains. Colorado Sunset (Posterized Photo), a photo by randubnick on Flickr. This image began with a photo that I took during a recent trip to Colorado. 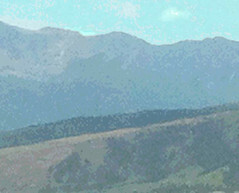 I cropped this view of the mountains from the background of a picture that I took during a drive along the Front Range. 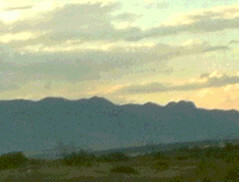 This is a view of the mountains seen from the highway between Colorado Springs and Pueblo, the landscape that I knew when I was growing up. I used Painter to fiddle with the focus and exposure, and then posterized the result to get this image. This is the landscape I imagine when I think about home. Across the River, a photo by randubnick on Flickr. This is a photograph that I took during an after dinner walk. I took this picture from a little nature path behind a local Starbucks. 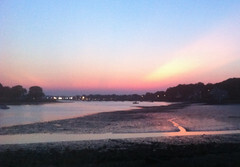 This is the view of the Bass River, looking toward the Ryal Side neighborhood here in Beverly, MA. Even though it was still hot after dinner, it was nice to cool off by the river. I liked the long lines of the river bank, so I took this photo. Tonight I did a little bit of editing in iPhoto to adjust the exposure and crop the image. Composition with Water, a photo by randubnick on Flickr. This image started with a photograph that I took on August 24 during an evening walk at Obear Park, here in Beverly, MA. There is usually a spectacular sunset to photograph during these evening walks, but there are quieter scenes as well, such as this view of waves near the shore. 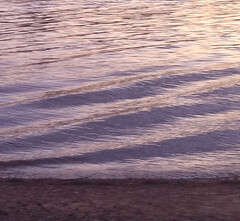 You can see some of the sunset colors reflected in the water, and the colors enhance the patterns of the waves. Tonight I used iPhoto to do a little post-production color correction on the photo, and then cropped it to get this composition. Chicken Collage Day 6 (Sept 3 2011), a photo by randubnick on Flickr. Today I went to the studio and worked on this collage for a while. This is going to be an image of a chicken, done in patterns. I got this idea while looking at the beautiful little chickens at Long Hill Gardens here in Beverly, MA. 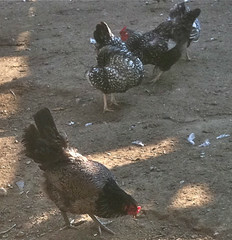 (In the photo I posted last night, you can see all the patterns in their feathers.) So I resumed work on the tail today. Last time I worked on this collage, I had run out of the orange and white paper I was using, cut from a pet store bag , but yesterday I bought some dog food, so I had another bag with me this morning. (Thank you, "Unleashed" by Petco.) So I finished the orange lines that suggest the structure of the tail feathers, and then added the five white squares with black circles. I liked the way that looked, but wasn't sure what to do next. I tried out a few ideas with pieces of paper, but I didn't paste anything else down. So I decided to stop for the day, and give myself a chance to look at what I have so far and think about what to do next. Chickens at Long Hill Gardens (Resource Photo for Collage), a photo by randubnick on Flickr. These are some of the chickens that inspired the collage I have been working on, an image of a chicken made up of patterns. Tonight I cropped this image from a photo that I took at Long Hill Gardens a few weeks ago. If you look closely, you can see the beautiful patterns in the feathers of these little birds. I plan to do more work on my funny little collage this weekend. . . . 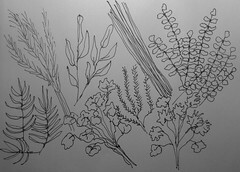 Herbs (Pen and Ink Sketch), a photo by randubnick on Flickr. Today was Thursday and time for the weekly trip to The Food Project at Long Hill. It's fun to go there and collect our selection of vegetables, and today we also got to pick green beans, cherry tomatoes, and herbs out in the field. But the trip to Long Hill is never the end of the story. Once I get home, everything has to be cleaned up, packaged, and put away in the fridge. By the time I got finished with all that, I just wanted to sit down for a few minutes. But I had an idea for a drawing, so I grabbed a Sharpie pen and sketch pad on my way to the couch. I thought it would be a good exercise to sketch the herbs in pen and ink, trying to capture their different shapes, lines, and textures. I worked from memory (very recent memory because I had just put them all away in the fridge). I think most of the herbs are recognizable. In any case I had fun, and even though I was resting on the couch, my pen and ink technique got a little workout.